^ a b c #JapaneseCruiserspp.32,34, "Hull and Protection Particulars". p.34,Drawing 1.14, "Kuma Class, Midships Section". ^ a b #JapaneseCruisers(1997)p.167,TABLE 5.1, "Fitting of the Mobile Kure Type No.2 Catapult Model 3 and Tripod Mainmast"
^ a b c d e f g #JapaneseCruisers(1997)pp.196-198, "First Modification of The Tama (April-November 1934 at Maizuru)". ^ a b c d #JapaneseCruisers(1997)p.171, Drawing 5.4. "Tama, Side View of Bridge(1935, after Modification)". And p.172, Drawing 5.5. "Tama, Layout of Bridge Decks and Inbord Profile of Bridge(1935-1941)". ^ #JapaneseCruisers(1997)p.169, TABLE 5.5, "Modification of Boilers, Stability, and Hull Strengths of the 5,500-Ton Cruisers"
^ #JapaneseCruisers(1997)p.167,TABLE 5.3, "Modification of the Antiaircraft of the Kuma Class"
^ #JapaneseCruisers(1997)p.169, TABLE 5.6, "Displacement and Main Stability Data for the 5,500-Ton Units and the Tenryu After Modification"
^ a b c d e f g #JapaneseCruisers(1997)pp.381-383, "Repair and Modifications of the Tama (Octobar-December 1943) and Kiso (November 1943 - March 1944)." ^ a b c d #JapaneseCruisers(1997)p.371, TABLE 8.1, "Wartime Modifications of the Armament of the 5,500-Ton Cruisers." ^ a b #JapaneseCruisers(1997)p.372, TABLE 8.2, "Installation of No.21 Air-Search Rader in the 5,500-Ton Cruisers." ^ a b c d e f #JapaneseCruisers(1997)p.373, TABLE 8.3, "Wartime Refits and Modifications of the Kuma Class." ^ a b c #JapaneseCruisers(1997)p.383, "Final Activities of the Tama and Kiso (July -November 1944)." Evans, David (1979). Kaigun : Strategy, Tactics, and Technology in the Imperial Japanese Navy, 1887-1941. Naval Institute Press. ISBN 0-87021-192-7. Howarth, Stephen (1983). The Fighting Ships of the Rising Sun: The Drama of the Imperial Japanese Navy, 1895-1945. Atheneum. ISBN 0-689-11402-8. Jentsura, Hansgeorg (1976). Warships of the Imperial Japanese Navy, 1869-1945. Naval Institute Press. ISBN 0-87021-893-X. Lorelli, John A (1997). Battle of the Komandorski Islands, March 1943. Naval Institute Press. ISBN 0-87021-311-3. Tate, E Mowbray (1986). Transpacific Steam: The Story of Steam Navigation from the Pacific Coast of North America to the Far East and the Antipodes, 1867-1941. Cornwall Books. ISBN 0-8453-4792-6. Whitley, M.J. (1995). 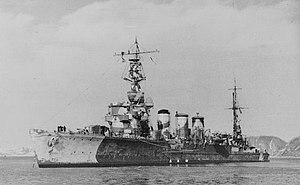 Cruisers of World War Two: An International Encyclopedia. Naval Institute Press. ISBN 1-55750-141-6.